I’m being so completely neglectful of my blog this month because I am in the last stages of my Reflexology study. I’ve been studying at Nature Care College Guildford with Carole Armstrong since last October, and am hoping to qualify on the 8th July. 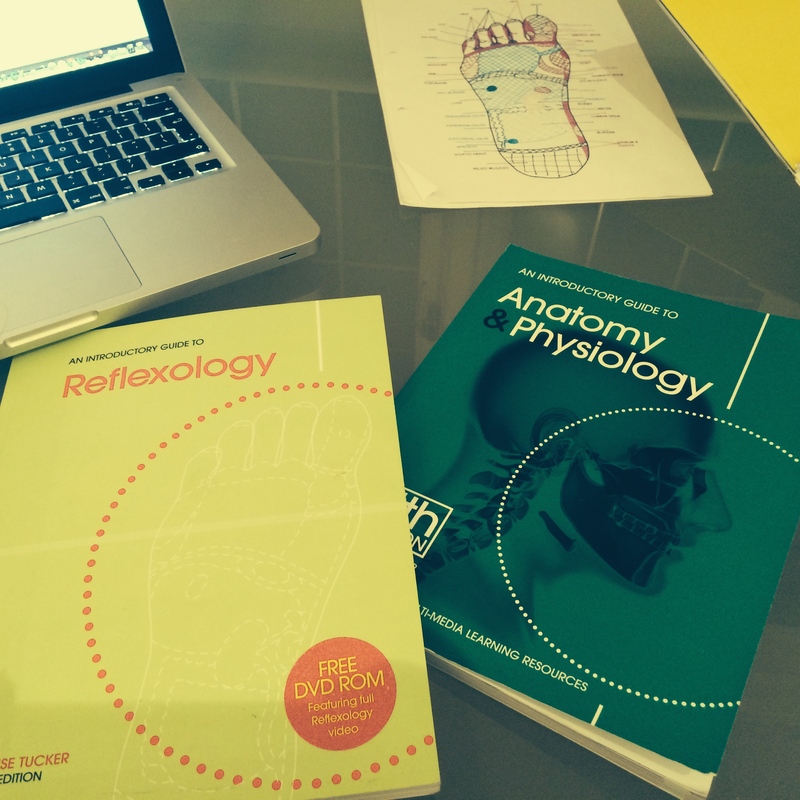 The new level 3 reflexology diploma requires us to do 100 case studies, as well as pass the Level 3 diploma in Anatomy and Physiology, and as I was away in North Carolina earlier this month I have rather a lot to cover before the exam. 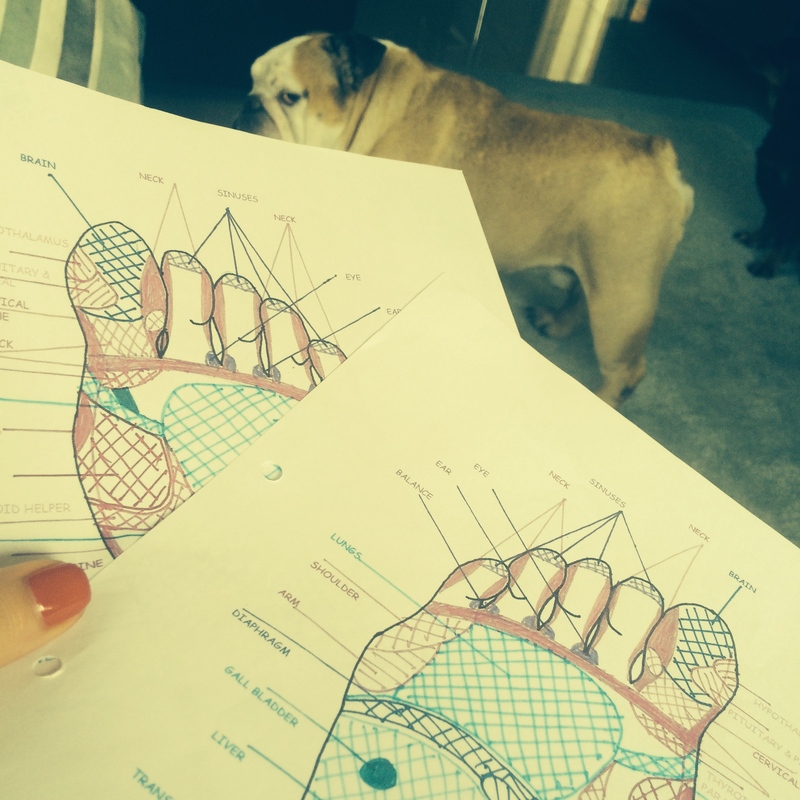 I’ve enjoyed the course immensely – reflexology has always been a favourite treatment of mine. I have been going to see Paolo Lai at Nevilles Salon in London for treatments for many years now – and he gave me so much knowledge before I even thought of starting to study. I’ve always been interested in holistic treatments – a blog that I did in 2012 on sleep and pressure points has been one of my all time most read posts – I think it’s an area that lots of people are interested in. Wish me luck, and thank you to all my willing friends and family who’ve let me treat them! Wishing you the very best of luck with your exam Susie! I’m sure it will go well. Reflexology is fascinating so much to learn and discover! I am doing the course at the moment and we have to do only 40 case studies which I thought it’s a lot. 100 case studies, fair play to you! If it is not too much to ask could I have the foot charts from the pics with the dog? I find them very well done! Good luck with yours too! I can’t upload the foot charts as they are property of my teacher Carole. But if you email her via Nature Care College Guildford she may be happy to share them, I’m not sure how that works! The best of luck Suzy. I remember your sleep post as I bookmarked it and refer to it often. I’ve just handed in 3 lever arch files of 100 treatments and my business assignment with 5 minutes to spare until the absolute deadline, and I can’t tell you the relief now that’s it all and done. It was hanging over my head. Now just for the revision for the AP&P exam on Monday. Good luck! That is so good to hear! I am handing mine in on Saturday and am sitting here doing it all right now! When we were told to write up everything as we went along I obviously wasn’t listening hard enough! Well done and thank you. I have just completed my Complimentary Therapies course and although it was hard work, what with working full time as well, I love it. Its tough going I know, but well worth it. My friends are totally converted in these therapies and I just love it when they tell me they feel the benefits. I’m waiting for the result from the examining body having just completed my course. Yes, 100 treatments certainly says whether you’re properly qualified or not. Words can’t describe the ‘sharing’ experience of a treatment. Safe journey wherever you travel in life. It’s always good to read about people passionate about reflexology. Your course sounds very comprehensive which is ideal as it’s best to invest in quality training. I love providing reflexology for my clients and hope your passion continues.